The meeting began with reports of a wagon that was parked in a dangerous position on the footpath/road by the unoccupied shop by St Matthews Church. The Chairman said this had been reported earlier and the Beat Manager of the police in our area had spoken to the owners of the wagon on this subject. Obviously, no notice had been taken and the wagon was still causing danger to pedestrians and road users alike. The Chairman said that he would speak to the Beat Manager again about this problem. There were 3 reports of personal nuisance, 5 of violence, 2 of Criminal Damage and 2 of suspicious persons over the December period. The potholes in the whole area were causing problems to motorists and the Chairman asked if the residents of the Parish could contact Cheshire East Highways about their concerns. The more complaints received the greater the data captured as action is built on intelligence. The street lights throughout the village had not all been updated to the new design, and further areas will be reported. Two Parish Councillors were to meet with a Cheshire East representative to look at road safety concerns around the Dingle. The Chairman said the Carol Singing service in St Matthews Church was very well organised and it was a very good community service. The Carols Singing around the Village Green was well attended despite the weather and the Chairman thanked all who had been involved in this event. The Chairman had met with the police Crime commissioner before Christmas and speeding throughout the Parish was still an issue and concerns were repeatedly passed onto the police regarding this. There were in excess of 31 activations with TRU CAM in the village. There is a PCSO in every ward area, but no police officer designated in this area but recruiting for this is taking place this month. The Chairman stressed that individual Councillors should not get involved personally with reported complaints. All complaints should go through the Parish Clerk. The elections for Town and Parish Councils will take place on 2 May 2019. Councillor Geoff Beadle has stepped in to take the Chairmanship of the Gutterscroft Centre following the sad death of Councillor John Hammond. A concerned resident spoke on behalf of the Parish Council at a planning meeting regarding the building of houses by the old Print Works at the back of Sandfield House. 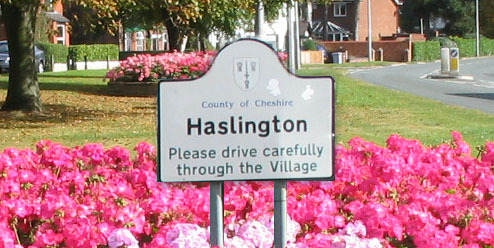 He voiced the concerns of the Parish Council on more building in the Parish, but the application was granted by Cheshire East Planning Committee. The hedges at the Limes in Winterley were still in need of trimming and the manhole cover opposite Pool Farm drive was missing. There is still an ongoing problem with the bus stop at Oakhanger. The sign for the bus stop for Crewe has not been reinstated since work had been carried out at the bush shelter. This has been reported once again to the Hanley Depot. The minutes for this meeting could be viewed after the next meeting to be held on 4 February 2019/ Any complaints or problems to be made direct to the Clerk, Mrs Joan Adams on 01270 569760.